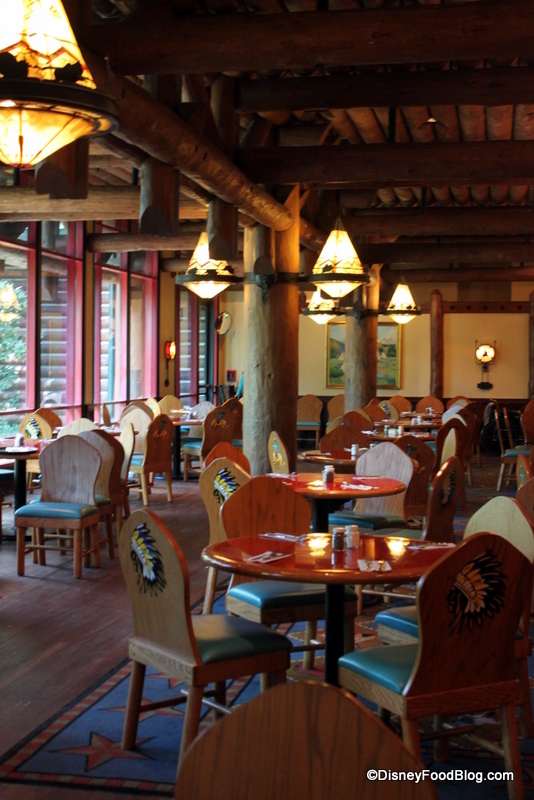 Wilderness Lodge is themed to represent an historic resort in the Pacific Northwest, complete with “log cabin” construction (albeit a BIG log cabin…). 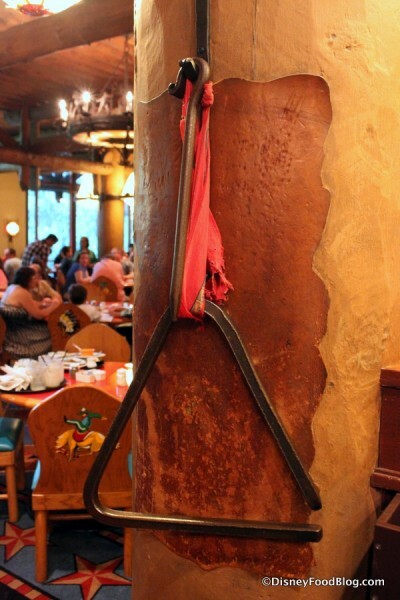 You’ll find massive totem poles flanking the lobby, Native American design elements throughout the resort, and even giant tee-pees as light fixtures. And while Artist Point (the hotel’s more expensive signature dining spot) explores a more refined approach to Arts and Crafts style and Territory Lounge is geared toward your inner explorer, it’s full-on “Cowboys and Indians” play time here at Whispering Canyon. 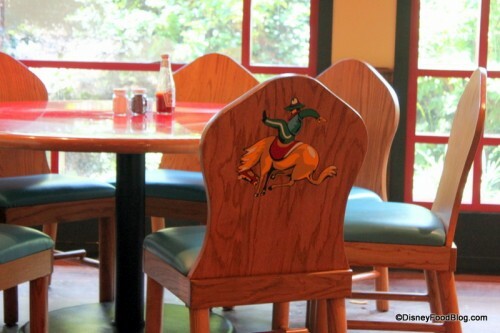 Tables and booths are offered for seating, and the wooden backed chairs that are actually pretty comfortable. Be sure to check the back of your chair to see if you’re a Cowboy or an Indian! But there’s more to the playful feeling here than just the decor. Kids can enjoy fun games, like hobby horse races around the perimeter of the restaurant. And adults can enjoy the humorous shenanigans of the servers. Because the fun and games here are largely interactive, the staff understand that not everyone is up for the silliness (which some guests have been known to experience as rudeness). 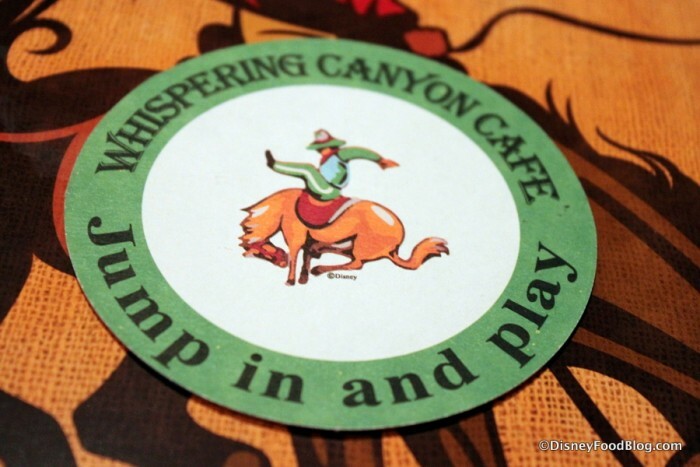 So recently, Whispering Canyon has taken steps to help guests let them know in an easy way whether or not they’re up for the fun. Prefer to observe rather than participate? There’s a card for that! It can be a very fun place, whether you decide to play along or just watch from the fence. But note that the “show” tends to ramp up at breakfast and dinner, and especially during busy times (of the year, and of the day). Since the guest interaction is what makes the experience, an empty restaurant isn’t nearly as exciting. 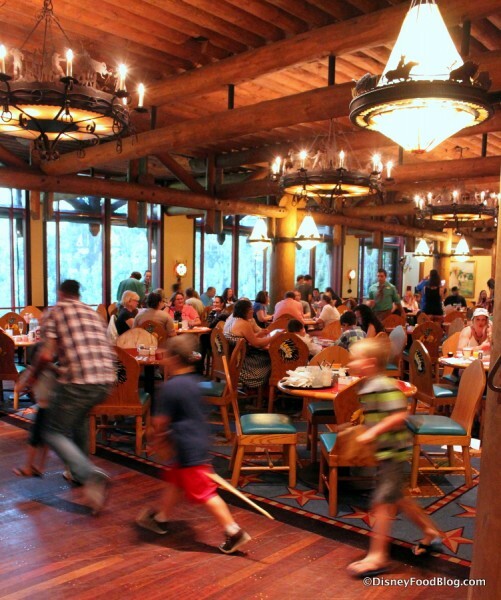 If you’d rather avoid the majority of the craziness during your meal, head to the restaurant for a late breakfast or for lunch, when most guests are playing in the parks. But we’ve talked enough about the fun, right? Time to turn now to the food. 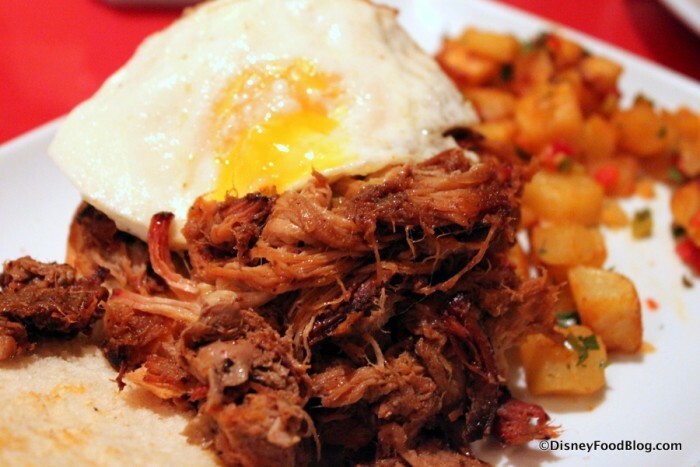 Regardless of the time of day you’re dining at WCC, expect heavy dishes in hearty portions. After all, it takes a lot of energy to drive dogies, defend the tribe, etc, etc. All-You-Care-to-Enjoy Skillets are a long-standing guest favorite here. It’s like having your own personal buffet! But having it on the menu along with a la carte options is nice, since it means that everyone at the table can enjoy their favored approach to the meal at hand. You’ll find the skillets all day — with different options, of course — for breakfast, lunch, and dinner. 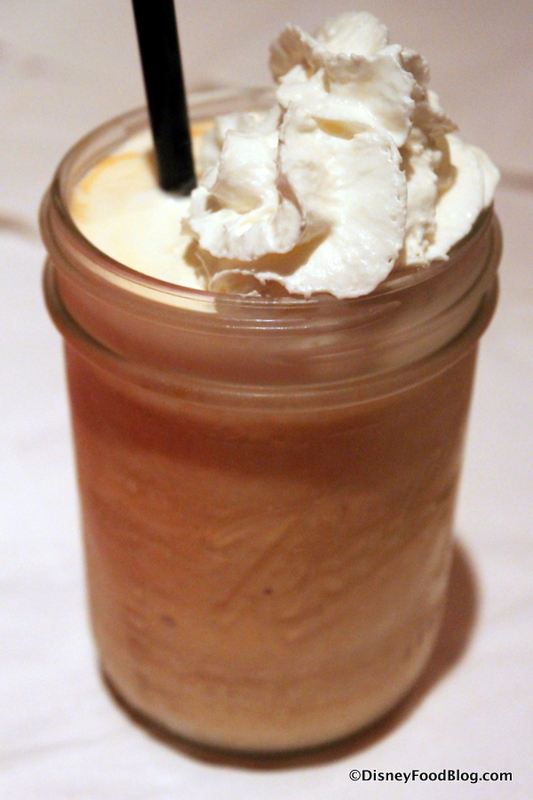 Bottomless Milkshakes are another guest favorite. While I’ve only seen them in Chocolate, Vanilla, or Strawberry in the past, the day we visited, there was also a Caramel Shake! No way was I passing this up. And oh my my. This thing was ah-mazing. Seriously, I couldn’t stop drinking it. I had to put it on the other side of the table so I couldn’t reach it. 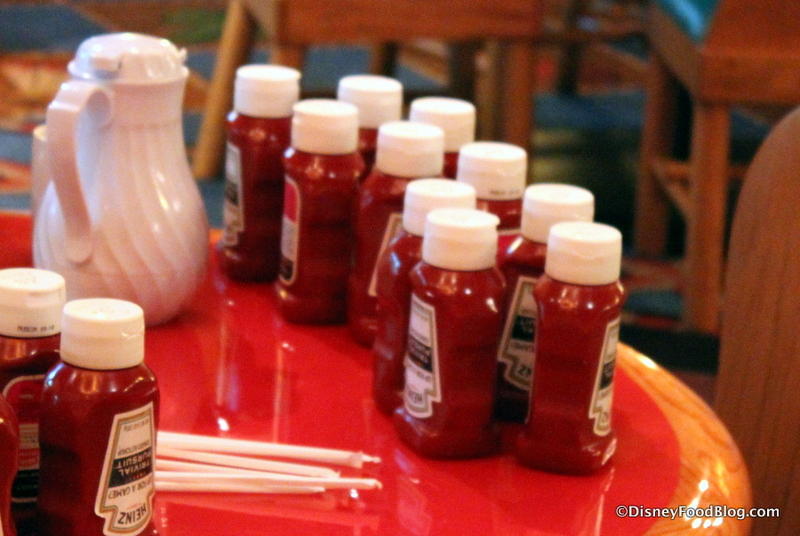 You guys know I eat a LOT when I’m in Disney World, so I usually know my limits when it comes to taking one or two bites or sips of something and moving on. But this shake was addictive. Just be forewarned, especially since it’s bottomless! While looking over the menu, my friend and I instantly noticed the Pecan Sticky Bun under the list of Starters. 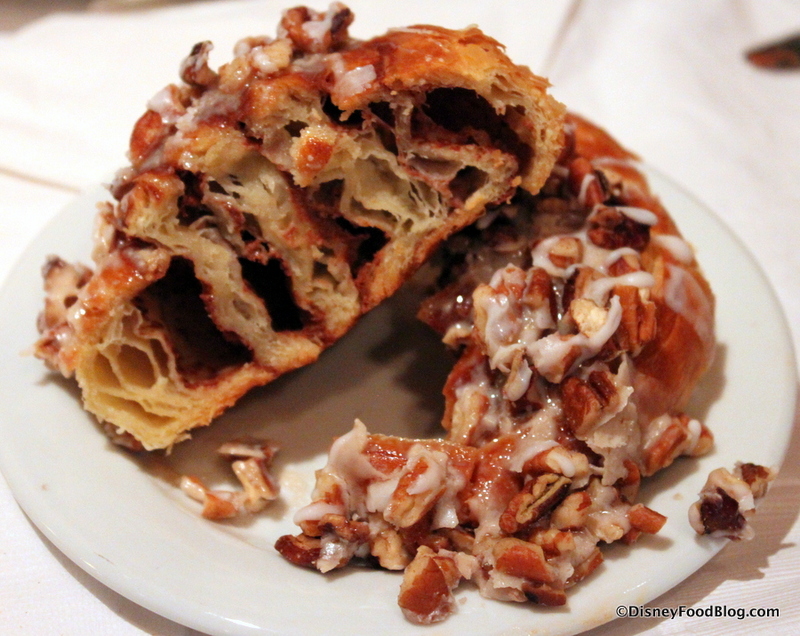 I, like so many of you, am still lamenting the extinction of that incredible Warm Honey Pecan Cinnamon Roll from Kouzzina (see a picture of it in this review of Kouzzina’s replacement, Trattoria al Forno). So I was hoping that maybe, just maybe, this would be like that. But…no. It was sorely lacking in terms of richness and moisture. And Icing. This is certainly not worth the add on in terms of money or calories, IMO. Luckily, I was mainlining that caramel shake, so I didn’t really have time to lament the lacking nature of the sticky bun. 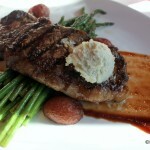 Things move pretty quick at WCC, so let’s head on to our entrees! 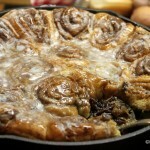 I chose to sample the All You Care to Enjoy Breakfast Skillet. Since I was the only one at the table who went for this option, what you see is a platter built for one. 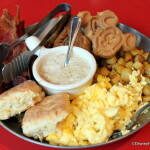 The platter consisted of Scrambled Eggs, Bacon, Sausage, a Mini Mickey Waffle, Home Fries, a Biscuit, and Gravy. While it was absolutely plenty of food, it was nice to know that I had the option to ask for seconds if there was anything that I wanted more of. This skillet is relatively standard. There are no huge stand-outs, though the home fries are nicely spiced and the gravy tastes homemade. The Mickey Waffle is always a nice touch. 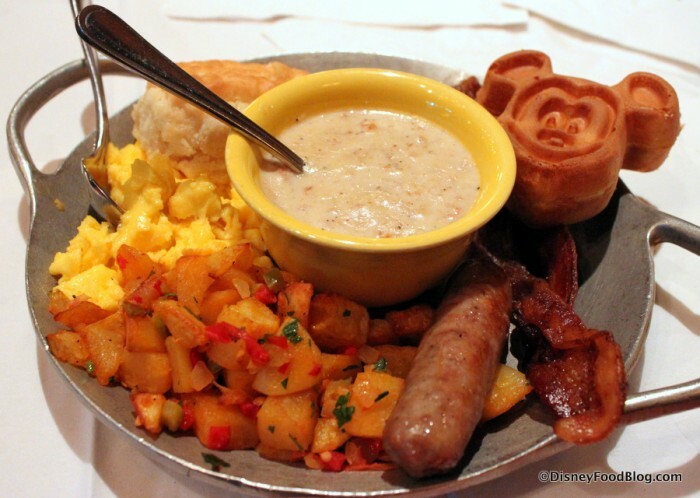 But the biscuit, bacon, eggs, and sausage were typical of most Disney breakfasts (including counter service breakfasts). 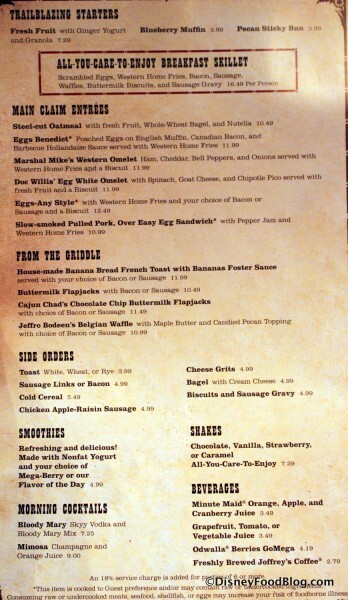 It’ll fill you up for a long day ahead, but there won’t be anything here that merits its own vacation scrapbook page. 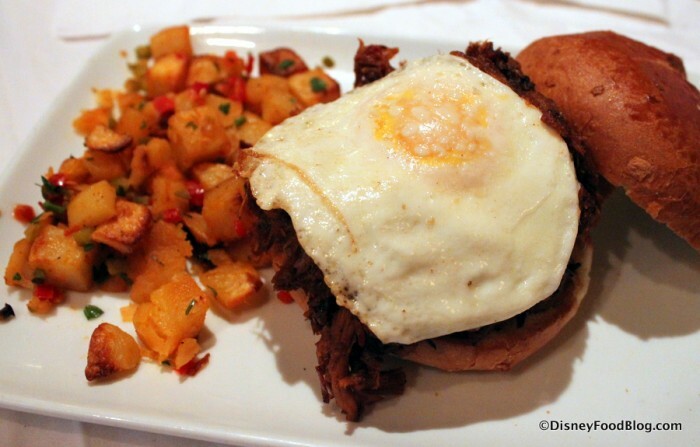 My friend opted for one of the more interesting menu options, the Slow Cooked Pulled Pork Over Easy Breakfast Sandwich, served with a side of Home Fries. It was a hearty start for the day, and a nice change of pace for someone who prefers a savory breakfast meal over a sweet one. The helping of Pulled Pork was substantial and it was really quite delicious — flavorful and not dry at all. 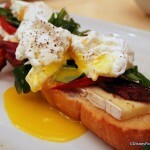 It complemented the richness of the Over Easy Egg. 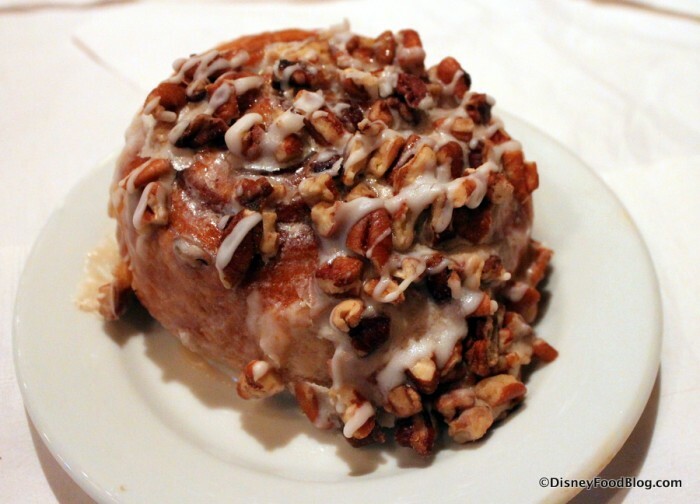 That said, you really DO need to enjoy lots of sweet to like this breakfast item! 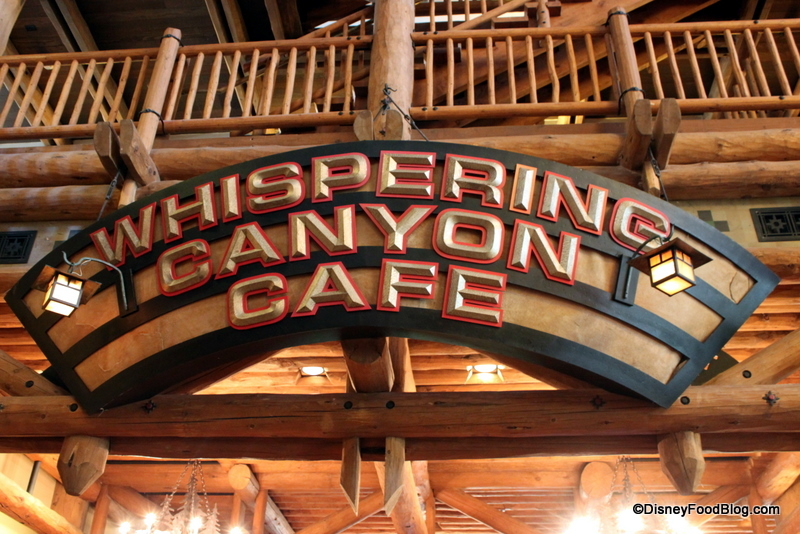 It had been forever since I’d had breakfast at Whispering Canyon Cafe, and the experience was still enjoyable. Our service was good, and all of the dishes that we ordered were well prepared. 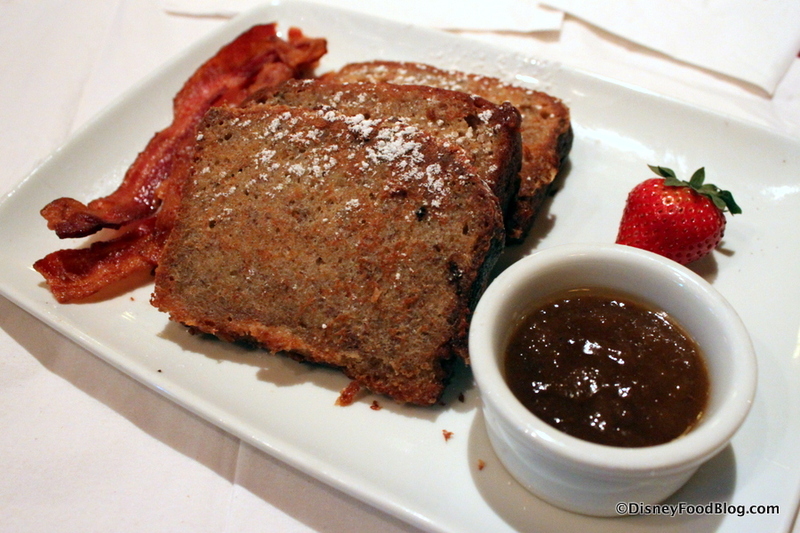 And although it can be hard to be inventive on a breakfast menu — especially when the themeing dictates a certain traditional, American approach — I think they do a pretty good job providing some less common options, like the Pulled Pork Sandwich and the Banana Bread French Toast. And guests who want all of the bounty of a buffet without the hassle of trips back and forth to fetch food will enjoy the Skillet option. 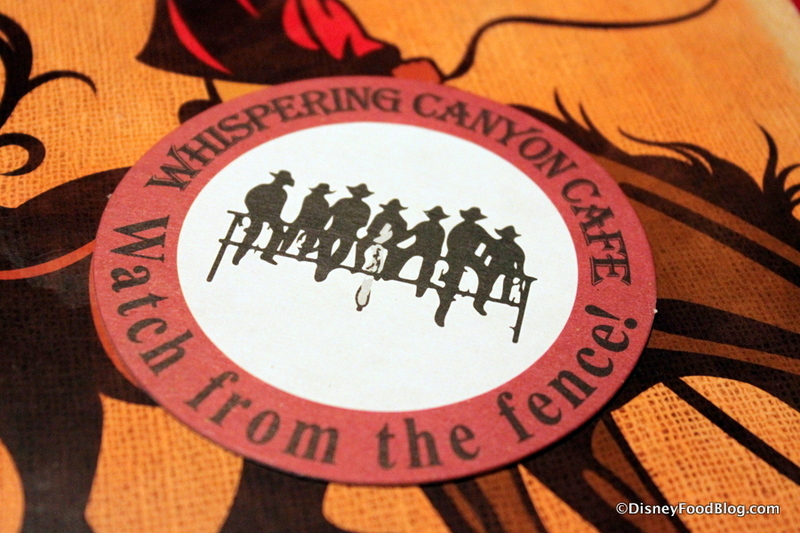 Whether you’re staying at Wilderness Lodge or you simply want to enjoy a hearty breakfast, I think Whispering Canyon is worth checking out, especially if you like your flapjacks with a side of fun. Is Whispering Canyon Cafe one of your favorite breakfast spots? Leave a comment and tell us what you think of this raucous restaurant! We love this place. We have been here several times and the only thing I can remember us having is the “All you care to enjoy” breakfast. We call this restaurant “The Empty Skillet”. Guess we know why. The food is great. Atmosphere a bit loud but it is fun. I like that you can choose not to participate in the antics but it’s fun to watch. We’ve eaten there a couple of times and I think at breakfast they need to tone down the ‘games’ and interaction. I’ve seen some people get really upset at the activity and noise around them. Most of us just flip the disk to red and the staff makes a special effort to not bother you but they can’t control the patrons noise. 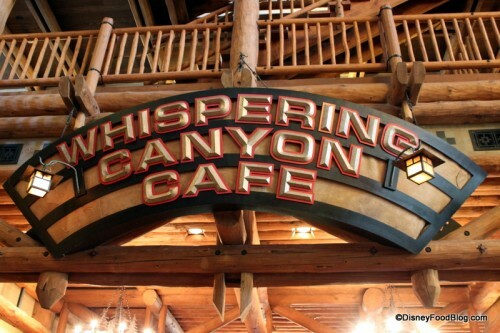 Breakfast at Whispering Canyon has been a Must Do for us for years. We love the food and the atmosphere, and especially watching non-morning people walk in, not expecting a rip-roarin’ breakfast. Looking forward to our upcoming trip in late August! We’ve never had breakfast here, but this is one of my favorite dinner spots in the World. 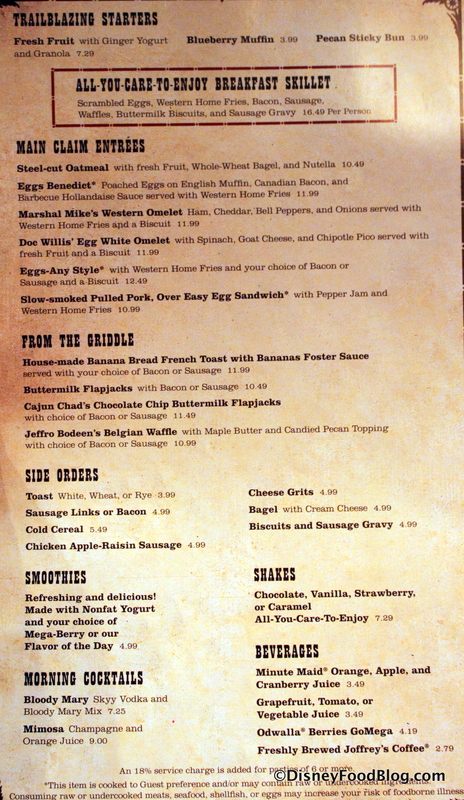 The endless skillet and bottomless milkshakes are my favorite! AJ – I know you are a fellow cilantro-hater. Those green flakes on the Home Fries look like they might be cilantro, please tell me its parsley!! Courtney – I don’t THINK it was cilantro — but check when you order just to be sure!